For other uses, see Walking Man (disambiguation). 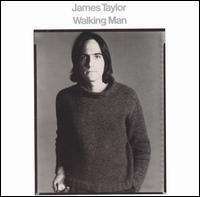 Walking Man is the fifth studio album by singer-songwriter James Taylor. Released on June 1, 1974, it was not as successful as his previous efforts, only reaching #13 on the Billboard Album Chart and only selling 300,000 copies in the USA. It is also the only studio album he released that never received a certification as a gold record from the RIAA. The song "Walking Man", released as the album's first single, failed to place on the Billboard Hot 100 chart at all, but nevertheless stands today as an often reprised fan favorite. "Hello Old Friend" was used in the intro for ABC's Game 3 coverage of the 1989 World Series, just before the pre-game broadcast was interrupted by a 6.9 magnitude earthquake. All songs were written and composed by James Taylor where not otherwise noted. ↑ Graff, Gary; Durchholz, Daniel (eds) (1999). MusicHound Rock: The Essential Album Guide. Farmington Hills, MI: Visible Ink Press. p. 1125. ISBN 1-57859-061-2. ↑ "James Taylor: Album Guide". rollingstone.com. Archived from the original on January 5, 2013. Retrieved October 27, 2015.